To my eyes, that's just a three-way interchange. Plenty of non-freeway examples of that out there; I can think of several off the top of my head in Texas. I'd argue that's a flyover, but the term is definitely being used very loosely in this thread. Some are just bridges and others are just trumpet interchanges with a smoother outer ramp. 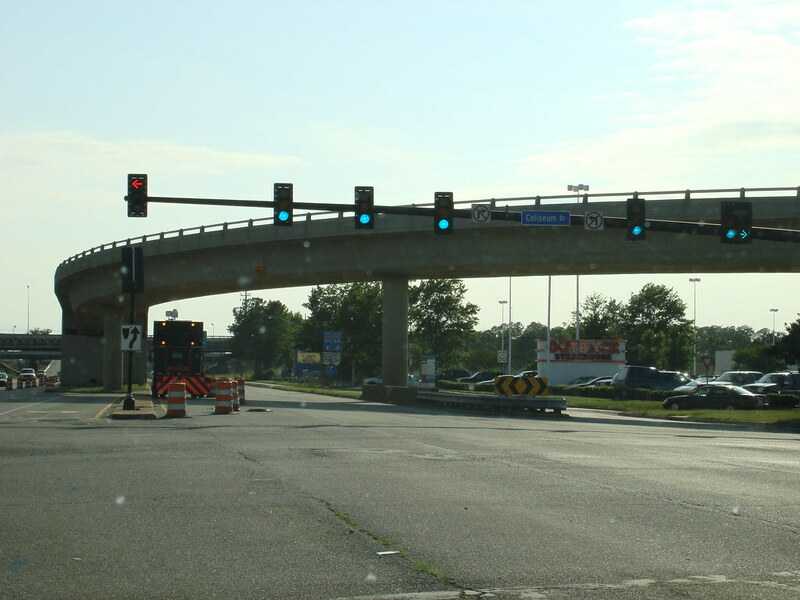 A flyover formerly existed in Hampton, VA at the intersection of Mercury Blvd and Coliseum Drive. It was closed and demolished soon after Coliseum Mall shut down in 2007. One was built for northbound KY 3 at KY 645 in Inez. What is the point of this flyover? Neither route is particularly busy. KY-645 is a four-lane highway, so it's not completely out of place. But it's a great example nonetheless. IIRC (and from past discussions with HB), it's a safety thing. KY 3 has a decent length downhill grade, with the 3/645 junction at the bottom of the grade. I imagine there were enough coal (or other) trucks not being able to stop in time to avoid crashing through the intersection that they put the flyover in to avoid the problem. US 101 and SR 117 in Port Angeles, WA is the same sort of idea. Summerlin Rd at Gladiolous Dr in Greater Ft Myers, FL (unincorporated Lee Co south of Ft Myers). Actually two flyovers here for the two heaviest left turn moves. Yep. I don't know if this was funded as an HSIP project or not, however. The downhill grade is on KY 645 westbound, though. The issue was vehicles pulling across the eastbound lanes of 645 to stay on northbound 3/westbound 645. There was a stop condition on KY 3 northbound. Personally, I think a signal with plenty of warning and an advance flasher system for westbound 645 would have worked just as well, and for a lot less money. The 3/645 route links US 23 south of Paintsville to US 23 north of Paintsville and gives Inez a four-lane route. I'm pretty sure it was built with some specialty resource recovery (meaning coal) funding in the 1980s. This surprised me when I lived in the area about 15 years ago. A flyover for a shopping mall. Who'd a thunk? ^ Wasn't the only mall in Virginia to have one, either. There used to be a flyover from eastbound Mercury Blvd (US 258) to northbound Coliseum Dr to serve the former Coliseum Mall in Hampton, VA. It was removed ca. 2007 when the mall was torn down and redeveloped. In other states, the Mall of America in Bloomington, MN has two full semi-directional interchanges serving it (on MN 77 at both Lindau Ln and Killebrew Dr) as well as two traffic signals within the mall property itself. And the Schuylkill Mall in Frackville, PA has its own interchange on PA 61, just south of I-81. The earlier reported Auburn Supermall ramp was used in radio commercials for the mall, where one person in the ad beamed, "A shopping mall with its own exit!" And the other person gasped back "A shopping mall with its own exit!?" No, you get off the freeway, wait at a light, and then you can take this non-freeway flyover. I see the idea has been used at other malls. You use regular roads to get back to the freeway. Haha, very cool! I used to visit the mall a lot as a kid (not early enough to visit Incredible Universe, which looked like an awesome store), but always from the south end. No fond memories of using that overpass, as it wasn't accessibly from northbound 167. The overpass appears to be so lightly used, the signals at its eastern end are one of the few fully-incandescent signals I can think of. (Meaning, the intersection hasn't been modified at all since construction). There is a flyover north of Tallahassee somewhere. There are also some flyovers near ft. Walton beach airport. VA 3 and VA 3 Business in Ferry Farm, VA, although one could argue that VA 3 becomes a (very short) freeway at this intersection as VA 3 has an interchange with VA 2/US 17 Business just over the Rappahannock River. The flyover is westbound VA 3 exiting onto itself. At first the signs for the ramp were marked with yellow "exit only" warnings. It was so little used that the mall thought drivers thought they were going back on the freeway, so they had the yellow removed. This was reported in the Valley Daily News, which seems to be unavailable online. Wasn't the only mall in Virginia to have one, either. There used to be a flyover from eastbound Mercury Blvd (US 258) to northbound Coliseum Dr to serve the former Coliseum Mall in Hampton, VA. It was removed ca. 2007 when the mall was torn down and redeveloped. This is not a flyover, but is an underpass that does the same thing, a grade-separated connection from an arterial to a shopping mall. Parham Road to Regency Mall, west of Richmond, VA.
Has been resurfaced since that image was taken. There was a second one on Quioccasin Road about 500 feet away and it is visible in that image, but it was removed a couple years ago when they built a new major entrance to the mall at that location. Previously there was no one major entrance, just a collection of minor entrances. First thing I thought of was was US 319 southbound split from FL 61 just north of I-10. Haven't been to Ft. Walton in a long time, but I think the FL 85/ FL 123 intersections were redone. Alex told me about this intersection when I visited Southwest Florida back in 2016. I actually checked this intersection out driving around Ft. Myers. 202 is briefly a freeway from the flyover point to I-287. Another modified circle in NJ where nothing is a freeway is NJ 73's interchange with NJ 70. Come to think of it, NJ has a bunch of full interchanges with other non-freeways, like US 130 and US 30, not to mention the 73/38/41 set of interchanges. Actually, there are several business driveways between this interchange and US 22, so it qualifies for this thread.